Emails are the little black dress – or even tuxedo – of the marketing world. It’s a sales technique that never goes out of style. But just as the fashion industry is constantly changing and evolving, so should your email marketing campaign. Providing relevant and personalized content is the key to your campaign’s success, and will keep emails in the customer’s inbox, and away from the dark, scary trenches of their spam folder. If you’re like us, your inbox receives about ten to twenty new promotional emails per day. There are probably brands sending you offers you don’t even remember subscribing to. In that long list of emails, the ones that stand out aren’t just promoting semi-annual sales or by-one-get-one-free deals, they are providing you with services and reminders based on your interests and previous buying behavior. Here are 5 email marketing strategies we’ve collected from our own inbox that are simple to incorporate in your own email marketing campaign. 1. Thank the customer for signing up to receive emails. When a customer opts to be included in your brand’s email notification roster, they are giving your brand access into one the most informative and influential aspects of their daily lives: the inbox. To be given access to their inbox is a privilege, and it is important that you show your appreciation. 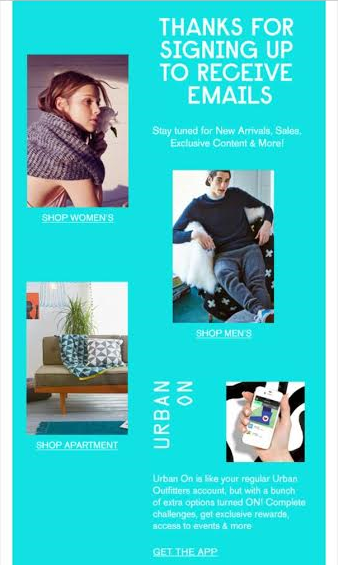 Urban Outfitters shows their appreciation to new subscribers by sending a simple, yet eye-catching “thank you” email, including a brief summary of what they can expect from the subscription. 2. Send out your emails in a timely manner. Promotional emails don’t have to be stunning works of art in order to make an impact on your customer. Sometimes, it’s just a matter of timing. The timing of your emails should be strategic with your product and audience. 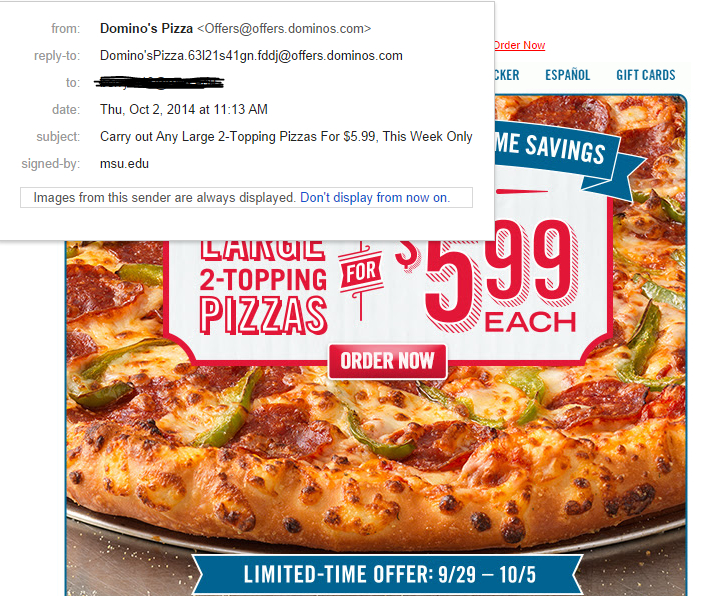 When Domino’s sends their weekly promotional offers to the customers, they time the delivery of their emails so that the customer will receive it just before lunch or dinner time. Once the customer opens the email, they let the product speak for itself. 3. Use emails to keep your customer interested in the product. Personalized emails are a very good strategy when promoting your product because a customer is more likely to buy a product that appears to be chosen for them. 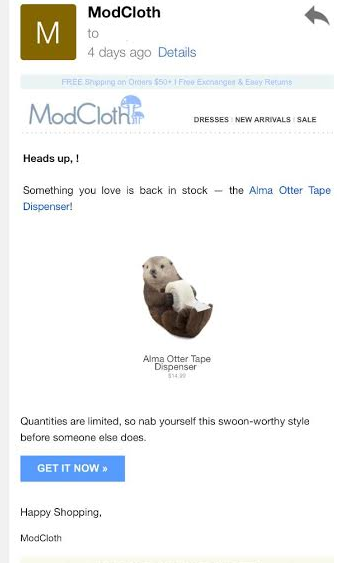 Vintage clothing retailer, ModCloth, doesn’t just use email marketing to promote their products to their customers, they use it to promote specific products to specific customers. They alert customers when a product they may have previously tried to purchase is back in stock, and warn that the quantities are limited. Not only does this stress the popularity of the product, but the need to buy it RIGHT. NOW. 4. Use emails to generate customer feedback. Most customers appreciate having a say in the matter whether their experience with the brand was good or bad. Just giving them the opportunity to voice their opinion about your brand speaks volumes about your customer service. 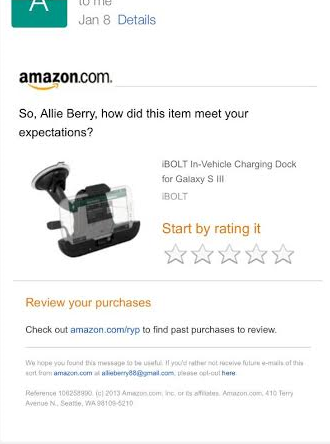 For Amazon, their customer service doesn’t stop with a receipt and simple “thank you.” Amazon inquires about a specific transaction the customer made and invites them to rate their experience. They also make sure the email is sent within a week the product is shipped so that the transaction is still fresh in the customer’s mind. 5. Always show your love. Email marketing is also a good opportunity to reach out to customers that haven’t been as active on your brand’s website as they once were. Sometimes it just takes a friendly reminder (and maybe a small discount) to lure the customer back on the website. 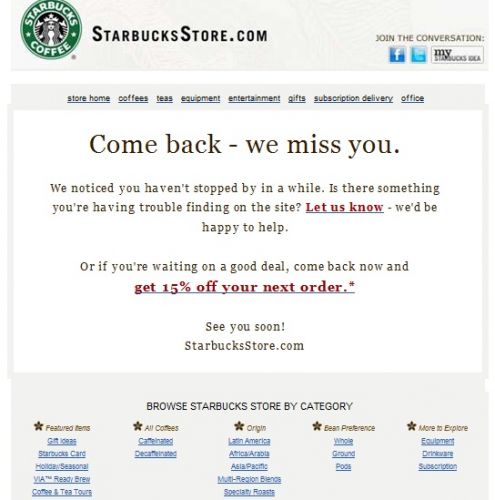 Starbucks sends a very blunt “we miss you” message to their long lost customers, and asks if their absence has something do with the site, itself. They even entice the customer to return by offering a discount on their next purchase. These five techniques will definitely come in handy when developing your own email marketing campaign. Take this opportunity to sell your brand’s customer service, and remind them why they signed up for your email notifications in the first place.